Caruncular nodular lesions are less commonly encountered in day-to-day ophthalmic practice. Histopathological examination by excision biopsy plays a major role in their diagnosis and treatment. Most of the caruncular tumors are benign in origin (95%), with only 5% having malignant potential. Pyogenic granuloma is next in frequency after caruncular papilloma and nevus. Levy et al. reported epithelial cyst occurrence along with nevi and papilloma. 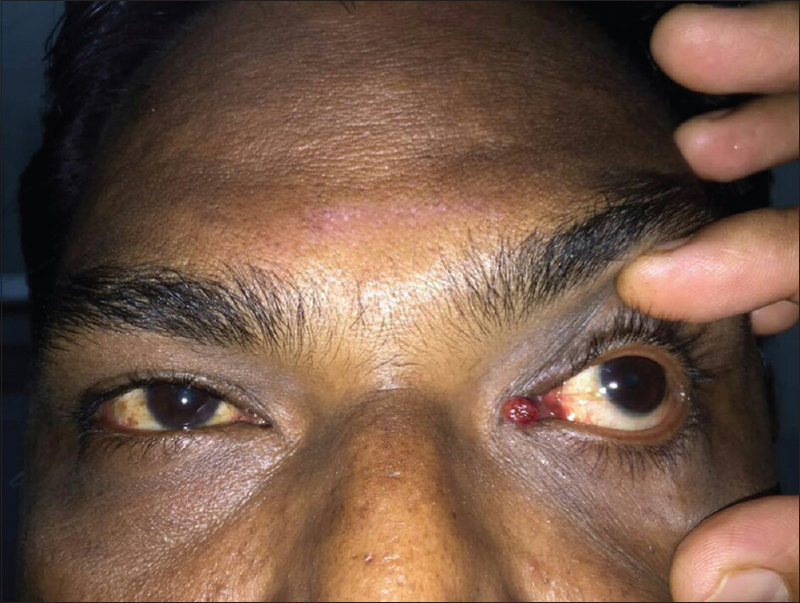 A 46-year-old male patient presented with the complaint of elevated red mass in the inner corner of the left eye for 2–3 days. On examination, his vision in both eyes was 6/6 for distance and N6 for near and there was a vascularized nodular lesion measuring 2 mm × 2 mm × 1 mm in caruncular area [Figure 1]. Rest of the ocular examination was normal. The patient was advised for excision biopsy, but he was not willing. He presented to us after 15 days with increase in size of the swelling. On examination, the lesion was vascular and of 3 mm × 5 mm × 2 mm in size. Excision biopsy was done and the specimen was sent for histopathological examination. The histopathological examination showed multiple lobules of tightly packed capillary blood vessels, scattered large blood-filled vascular spaces with portions of epithelium, and extensive inflammatory cells with bacterial clumps suggestive of lobular capillary hemangioma [Figure 2]. The patient was started on antibiotic–steroid combination eye drop which was tapered over 1-month period with artificial tear substitutes for 1 month and systemic nonsteroidal anti-inflammatory drugs with paracetamol combination twice a day for 3 days. Caruncle is lined by a nonkeratinized epithelium which is similar to conjunctival epithelium. Apart from this, it also contains hair follicles, sweat glands, sebaceous glands, and accessory lacrimal glands. Hence, caruncle can be involved by tumors of skin, conjunctiva, and lacrimal gland. Lesions commonly found at caruncle are papillomas and nevi. Other lesions of caruncle include oncocytoma, pyogenic granuloma, inclusion cysts, sebaceous hyperplasia, and sebaceous adenoma. Malignant tumors occurring rarely in the caruncle are squamous cell carcinoma, melanoma, lymphoma, and sebaceous carcinoma. Lobular capillary hemangioma is also called pyogenic granuloma. It is a misnomer as the condition is neither pyogenic (pus forming) nor granulomatous. It is a hyperplastic vascular lesion that occurs after trauma or inflammation. Clinically, pyogenic granuloma begins as small red papule that rapidly increases in size ranging from a few millimeters to several centimeters and its rapid growth can be followed by stabilization or regression. 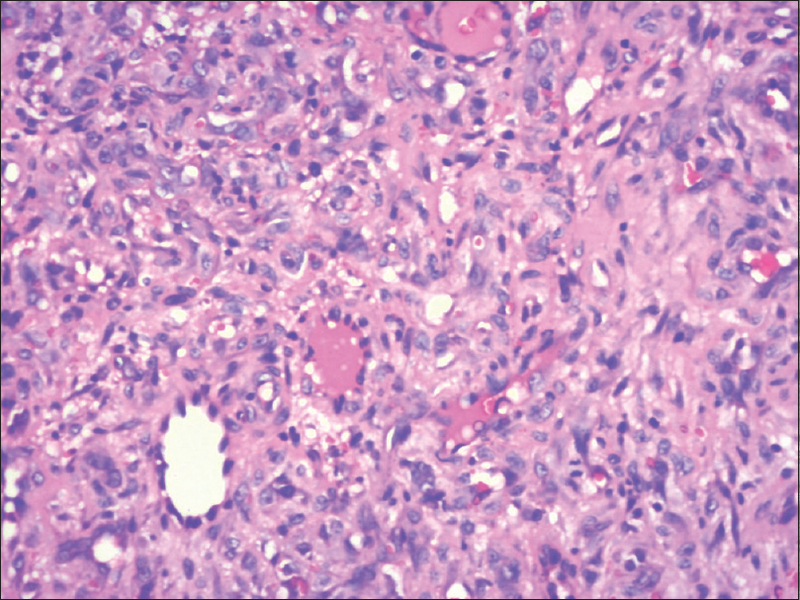 Common differentials are nodular Kaposi's sarcoma and angiosarcoma. Management involves excisional biopsy which is diagnostic as well as therapeutic. Histopathological examination plays a crucial role in diagnosing and differentiating it from other carunculur lesions. In India, one case has been reported for lobular capillary hemangioma of caruncle in 1968 by Ahmad and Hafeez. Caruncular tumors present rarely. Excisional biopsy should be done and malignancy should be ruled out whenever presented. Pyogenic granuloma is a rare presentation at caruncle. The predisposing factors should be corrected along with the definitive treatment to prevent further recurrence. Honavar SG, Manjandavida FP. Tumors of the ocular surface: A review. Indian J Ophthalmol 2015;63:187-203. Shields JA, Shields CL. Eyelid, conjunctival and orbital tumors. An Atlas and Textbook. 2nd ed. Philadelphia, PA: Lippincott Williams and Wilkins; 2008. p. 250-445. Levy J, Ilsar M, Deckel Y, Maly A, Pe'er J. Lesions of the caruncle: A description of 42 cases and a review of the literature. Eye (Lond) 2009;23:1004-18. Cherif N, Hermies F, Cori-Melki M, Pouliquen Y. Caruncular location of a pyogenic granuloma. About an anatomo-clinical observation. J Fr Ophthalmol 1994;17:617-9. Ravi V, Jacob M, Sivakumar A, Saravanan S, Priya K. Pyogenic granuloma of labial mucosa: A misnomer in an anomalous site. J Pharm Bioallied Sci 2012;4:S194-6. Christopher FD. Vascular tumors. Diagnostic Histopathology of Tumors. 3rd ed., Vol. 2. UK, PA: Elsevier Health Sciences; 2007. p. 41-82. Ahmad SH, Hafeez MA. Haemangioma of the caruncle of the eye. J All India Ophthalmol Soc 1968;16:103-4. Kaeser PF, Uffer S, Zografos L, Hamédani M. Tumors of the caruncle: A clinicopathologic correlation. Am J Ophthalmol 2006;142:448-55. Luthra CL, Doxanas MT, Green WR. Lesions of the caruncle: A clinicohistopathologic study. Surv Ophthalmol 1978;23:183-95. Santos A, Gómez-Leal A. Lesions of the lacrimal caruncle. Clinicopathologic features. Ophthalmology 1994;101:943-9. Shields CL, Shields JA, White D, Augsburger JJ. Types and frequency of lesions of the caruncle. Am J Ophthalmol 1986;102:771-8.